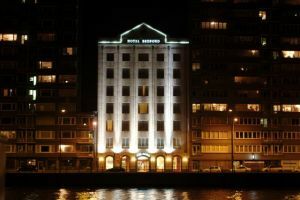 Quai Saint-Léonard 36, 4000 Liège, Belgium. 149 rooms 4 **** all equipped with TV, minibar, hairdryer, direct telephone, internet and air conditioning. Restaurant and breakfast room in the oldest part of the hotel ( 17 th. century). Conference and banquet rooms available from 15 to 240 persons, Fitness club, garden, terrasse and private parking at your disposal. Children less than 16 years and more than 12 year(s) old: 15.00 € for each additional bed. The Bar "John Cockerill" is open every day. The "Happy Hour" is from 17h30 until 19h00. The restaurant "Brasserie Faubourg Saint-Léonard" is situated in the 17 th century Convent, facing the garden and terrace. Our buffet style breakfast is served from 7h00 until 10h30 and the breakfast room is also situated in the 17th Century Convent. 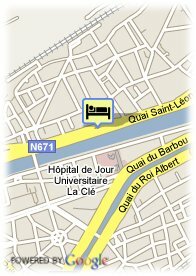 Situated on the banks of the river la Meuse and within walking distance to the historical city center with its activities and sites to visit. Easy access to the autoroutes coming from Germany, Holland and Paris.